Summer is the perfect time to visit Churchill, Manitoba! 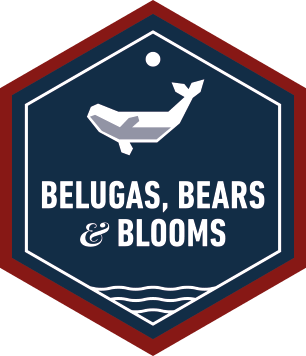 Thousands of belugas whales migrate into the Churchill River and the surrounding landscape erupts into colourful blooms. During the summer months of July and August, the Churchill River is home to thousands of beluga whales that migrate into the area to feed and give birth. You can experience the beauty of the beluga song by boat, kayak or, for the more adventurous, get up close and personal on a beluga whale paddleboarding adventure. Back on dry land, an official Tundra Buggy© excursion in the Churchill Wildlife Management Area completes the adventure. Enjoy the chance to see the tundra as you've never imagined it - blooming with colourful flowers and teeming with wildlife! You may even catch a glimpse of the first summer polar bears as they migrate through the area. This adventure is led by an Interpretive Guide and will be a unique summer experience will leave you in awe of the beauty of Canada's North. Enthusiast Level: This is our most well-rounded level of departure, with a mixture of cultural and wildlife adventures with fewer people (maximum 22 people on this departure) than the Adventurer level. This level of tour is led by a professional Interpretive Guide and offers guests the ability to focus on their adventures - we'll take care of the little details. Beluga whales by the thousands, colourful blooms erupting over the tundra, and you, soaking up the northern sun - how could summer get any better? My adventure began in Winnipeg, Frontiers North’s gateway to their Churchill adventures. After checking into my hotel, I met with the rest of the tour group and our Frontiers North Interpretive Guide. Our first order of business was a journey of discovery through the beautiful city of Winnipeg. We toured Manitoba’s largest city by bus, with stops at the infamous Manitoba Legislative Building, the historical Exchange District, a visit to St. Boniface – a charming French-speaking community in the heart of the city – and a stop at the Forks, Winnipeg’s most celebrated public space and the spot where the Assiniboine River and Red River meet. In the evening our guide hosted a welcome dinner for our tour group so that we could get to know our fellow travelers better and learn more about our upcoming adventure into the north. Our second day starts off with an early morning flight to Churchill. The two-hour flight took us from the prairies of central Manitoba, over boreal forest and taiga, and final to the colourful tundra of Churchill. Upon landing, we set out on a Churchill Town & Area tour to explore the area surrounding the town of Churchill, and our Frontiers North guide told us all about the historical significance of the places we visited: Cape Merry; the site of a crashed airplane affectionately known by locals as Miss Piggy; and Manitoba Conservation’s Polar Bear Holding Facility (aka Polar Bear Jail). We even had time to stop to enjoy a walk along the coast of the Hudson Bay – bring your bug spray! Today is our first encounter with Churchill’s beautiful beluga whales! We started our day with a three-hour boat tour on the Churchill River, zipping up and down the river beside pods of curious whales. The boat tour also included a stop for a walking tour at the historical Prince of Wales Fort where we learned about the famous explorers who lived at the fort in the 18th Century and how they managed to survive in Churchill’s harsh climate. Next, we joined a local dog musher for an exciting dog carting excursion through the boreal forest – what a rush! Our host introduced us to his team of sled dogs and explained to us the importance of dog sledding in northern culture and history. Day four brought us on an adventure into the vast and colourful Churchill Wildlife Management Area! In the morning we hopped on a world-famous Tundra Buggy® and headed out onto the tundra in search of summer polar bears, arctic foxes, hares, and more types of plants and flowers than you can imagine growing in the north! Our full-day tour allowed us to learn from our guide and Tundra Buggy driver about the many different types of plant life and animal life that are native to the Churchill area. We even stopped to have a picnic style lunch on the Buggy while we enjoyed the scenery around us! Our final morning in Churchill started on the river on an zodiac boat tour, giving us a chance to get even closer to the extraordinarily friendly beluga whales. The belugas were very curious and loved the bubbles from the zodiac’s motor – they followed us closely! 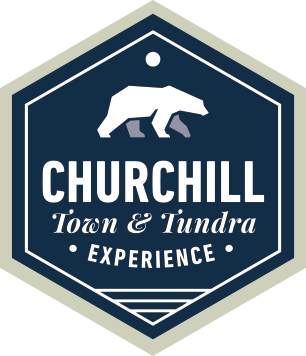 In the afternoon our group had some free time to explore Churchill’s gift shops and local tourist sights. We of course had to take our picture in front of the Inukshuk on the coast of Hudson’s Bay! Then it was back to the airport for our return flight to Winnipeg, where the group checked back into our hotel for a good night’s rest – a perfect time to go over the thousands of pictures I took! My Churchill adventure is over and I’m heading home – but I have a lot of wonderful photos to show my friends and family!